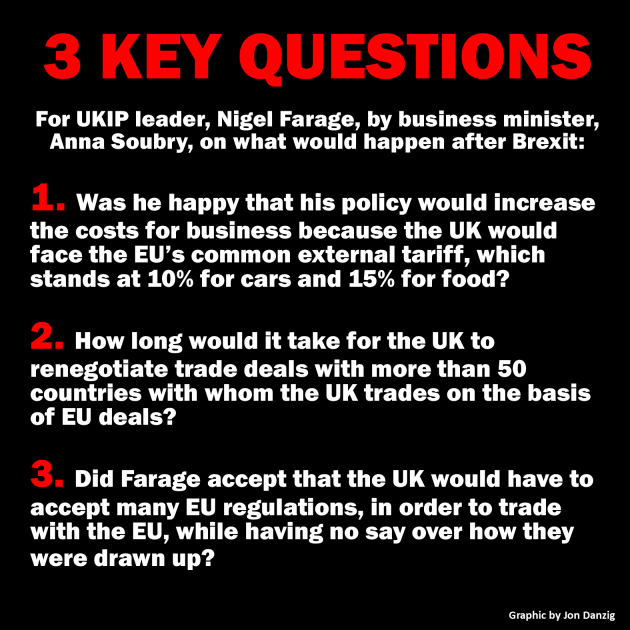 Business minister, Anna Soubry, the most enthusiastic pro-EU member of the government’s cabinet, has sent a letter to UKIP leader, Nigel Farage, with three vital questions. She posed the questions after Mr Farage made clear that he didn’t want Britain to remain in the Single Market of Europe if the referendum resulted in a ‘leave’ decision. Instead, said Mr Farage, he wanted Britain to be “a fully independent country” (although it’s not quite clear what that means). 1. Was he happy that his policy would increase the costs for business because the UK would face the EU’s common external tariff, which stands at 10% for cars and 15% for food? 2. How long would it take for the UK to renegotiate trade deals with more than 50 countries with whom the UK trades on the basis of EU deals? 3. 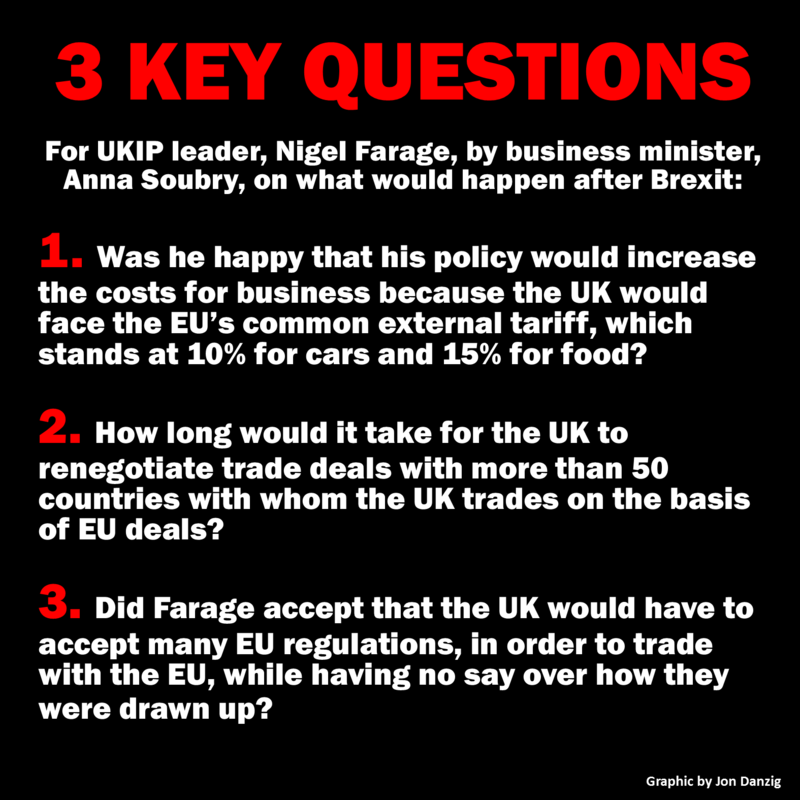 Did Farage accept that the UK would have to accept many EU regulations, in order to trade with the EU, while having no say over how they were drawn up? An answer is awaited from Mr Farage. Footnote: What interests me is why any answers from Mr Farage should be taken seriously? He is not in power. He is not a Member of Parliament. He is not in government. His party only has one MP who most often disagrees with Mr Farage on Britain’s possible Brexit terms. If Britain decides on 23 June to leave the EU, Mr Farage still won’t be in power. What difference will his answers make (assuming he can answer at all)? 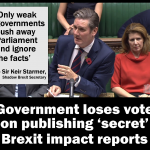 This entry was posted in Current Affairs, Democracy & Citizenship, Economics & Trade, Global & International, Media & Communications, The EU and tagged Anna Soubry, brexit, EU referendum, European Union, free trade agreement, Nigel Farage, Single Market. Bookmark the permalink. Q1 both EU Treaties and WTO Tariffs explicitly forbid punitive barriers to trade in the event of Article 50. Q2 WTO treaties forbid punitive tariffs whilst negotiations are progressed, it is in the interest of both parties to accelerate the negotiations, the fact that many of the countries would like to negotiate food exports, possible as we will be out of the ludicrous CAP would accelerate the process. Q3 all countries accept regulations on manufactured goods for exports to other nations, Political Union is unacceptable and unnecessary. We export goods to America, we accept regulations on the goods produced for their market, we are not a State in their Union. Who says that trade would be punitive? The EU would be applying the same rules to us as a non-EU/EEA member as other countries. That would seem fair. If countries could have free access to the European Union internal market without agreeing to the EU’s rules and paying for the privilege, why would the other 27 members bother to stay a member? 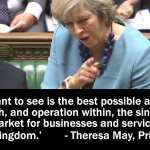 The thing is that free access to the EU single market on the same terms as we enjoy now simply won’t happen outside the EU. This has now been confirmed time and again. See Infacts.org for more specific answers. If they are not to be punitive, then they would need to be WTO compliant. And would work both ways, as we have a very large trade deficit with the EU, it would punish EU exporters. If it were WTO compliant the taffiffs would be minimal, the damage would be to German car manufacturers who export 800,000 high value cars to the EU, do you imagine they would accept that? The WTO rules are very strict, once a free trade zone has been enabled, to place tarriffs upon trade is strictly controlled, our position is not the same as the USA or Japan. And a trade deficit makes negotiations far easier, unlike Norway or Switzerland. I am sorry, i don’t consider infacts to be an independent source. The WTO is more reliable. As far as I can ascertain, there is nothing explicit in WTO rules about what happens if a state leaves a customs union. Indeed, I don’t think the WTO ever considered that anybody would be stupid enough to resurrect a 19th Century construct that creates a free trade zone protected by a wall of tariffs in the 20th Century, never mind the 21st, but here we are. So there is no certain ruling, merely a direction of travel within the WTO to consider. The WTO is designed to encourage and endorse free trade, in particular where such trade is in existence, it is hardly likely to endorse punishing the UK for wishing for the same whilst removing itself from a tariff based economic area. And if it did, who would pay the price? The UK, or the EU? Post Brexit the UK is the EU’s biggest customer, in fact bigger than the second and third customer combined. (One of your favourite Economists, Portes disagrees with this, I think he is wrong- unsurprisingly). A tariff wall against the UK costs EU business, at the same time the internal market, unlike the rest of the world, is shrinking. High tariffs are not going to be a threat, though I understand why they are being used as one. In all honesty Jon I think that the UK will vote to remain, far too few people will care about any of this and they will in all likelihood be frightened into staying within, for now, not for a generation. There are two issues that may alter that. The first is the immigration crisis into the EU, which is unfair, the EU will be held responsible, though in truth it is not really. The judgment on the EU by the electorate will be harsh though regardless. The second is the impending Euro crash, my background is International banking, I am looking at the state of Italian non performing loans and consider that what is coming will make Greece look like a walk in the park. Avoid those two issues before June 23 and the UK will likely vote to Remain, if either blows up before then, all bets are off. The idea of the European Union is not an impossibility, most of us would like to see a workable solution, but the mechanism, the construct, the ambition are not viable. Whether we vote to remain, or leave, changes one thing only, the speed of the collapse. It is strange how this oft-described democratic EU castle seems to be built on the sands of fear. 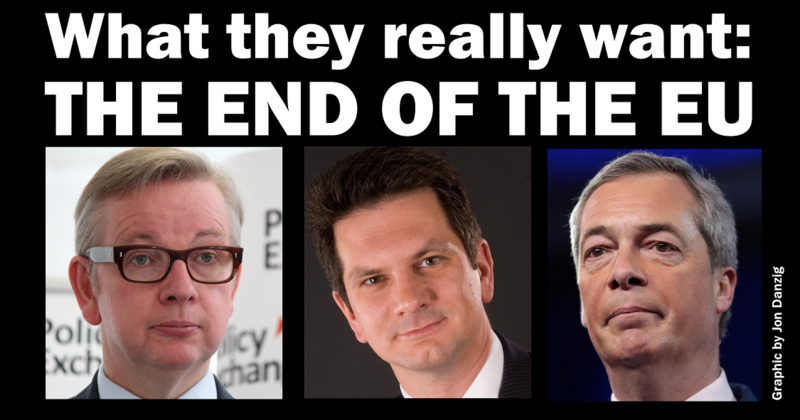 Jon Danzig, you are coming over as a bully – what makes you any different than the likes of Farage? Just been watching the Daily Politics, Portes was on, there appears to be a serious discrepancy between the estimated number of EU migrants and the number of NI numbers issued to EU citizens. In fact the NI numbers issued are 100% more than the numbers estimated. If he is correct this will be huge, immigration, rightly or wrongly, is the biggest issue that will drive the voters to the booth. Meanwhile the Greeks have withdrawn their Ambassador from Austria and the council of Ministers has broken up in disarray. Front page of the Sun today is on the disparity between estimated number of EU migrants and national insurance numbers produced. This will be a huge issue Jon, if as appears likely the numbers are flawed. 70% plus of our electorate wish to see immigration numbers cut. FOI requests pouring in, and the data is available, not good news for the Remain camp.. Agreed that immigration is is a big concern in the UK but I then ask the question, why can’t you get an English plumber in London? The answer is very simple. We never trained enough English nationals in 80’s & 90’s when apprenticeships were out of fashion. Our fault I’m afraid not Poland’s! Jon, have you blocked me from commenting on your articles, from March onwards it appears I cannot do so. I understood you welcomed an alternative view? Its very sad you appear to edit out a contradictory voice. Roy, I have written to you personally. Comments have been turned off for now as I am busy on other projects. I am quite worried that we might leave the EU, I think it would be economically difficult and not just in the short term but more important I think that in the long term the peace in Europe could breakdown. To try to inform people more about the issues I too publish a blog. I post about a different issue every two days, so far there are 26 posts and you can see them at http://www.poitoucharentesinphotos.wordpress.com.